Once again, I've decided to dream. Also, I learned from my Grammar Girl friend that my series should be called, "If I Were CEO" because this is really a fantasy series. Using the word "was" is for things that are or could be, where the use of "were" is for the dream world. You can read or listen to the whole explanation from Grammar Girl here. And, as you can see, I've changed the title to reflect "were" in this and my past posts in the series. I figure since this one is going to be on my favorite beverage company, about one of my favorite topic, and contain a list of "if" statements that are easily achievable by Pepsi, I'd work hard to make this a grammatically correct post. You never know when PepsiCo may follow you, right? I've been a Pepsi fan since having my first "soda". I have a specific memory of drinking a Mountain Dew (made by PepsiCo) when my dad was a maintenance/music pastor/landscaper at a church we attended when I was in elementary school. That means, I've been a fan now for over 20 years. I also remember being in a contest in Jr. High where I did a blind taste test of Pepsi, Coca-Cola, RC Cola, and PC Cola (the generic brand from Lucky Supermarkets where PC stood for President's Choice not Politically Correct). I was able to decipher which soda was which just by taste even back then. I've loved a variety of sodas made and sold by PepsiCo too. Pepsi, Wild Cherry Pepsi, Vanilla Pepsi, Crystal Pepsi, Pepsi Natural, Mountain Dew, Code Red, Live Wire, White Out, and even Dr. Slice are some of my all time favorites. If I were CEO of PepsiCo, the first thing I would do is return to real sugar for all the products under the brand. Yes, this would be more expensive than HFCS, but it would be the start to a move towards more natural ingredients. I would market the soda that way. I would provide the research and funding to show that sugar is more easily digested than HFCS. I would move Pepsi and the other products toward a healthier choice in soda consumption. Even as I'm writing this, I'm seeing a new line of Sierra Mist Natural commercials that are done exactly the way I would want them to be done. Go here and click on "see the ads". If I were CEO of PepsiCo, I would also change all diet formulas to use Stevia instead of the chemical sweetener, Aspartame, currently being used. Once again, I would show the benefits of a natural ingredient over a chemical one. These two sweetener changes would instantly give PepsiCo a leg up on the competition because of its health benefits. The body can deal with natural ingredients much better than chemicals and chemically altered sweeteners. If I were CEO of PepsiCo, I would bring back the option of glass bottles for all the soda lines. I would offer this option because there are so many people that feel like glass doesn't leave an after taste. Also, glass is an environmentally friendly option because it is easy to recycle and doesn't have the same harmful properties of plastics. I would offer only the 12 oz bottles, similar to those of the Pepsi Natural (pictured below) or current "made in Mexico" style (pictured above) because it could be made to work for all brands and streamline the manufacturing. 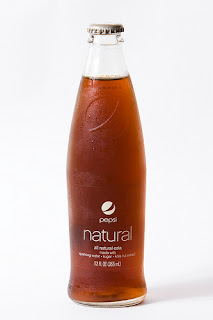 I would research using the Pepsi Natural bottle, with the Pepsi Logo stamped in the glass for all brands to bring the company's brands together (similar to GM badges on all their lines, although this may not be a great idea). I would re-introduce the glass bottle 6-pack at $5.00 per pack. This price is easily recognized as less than $1 per bottle, but is not so cheap that production costs would make it too expensive to offer. If I were CEO of PepsiCo, I would introduce an entire line of "Natural" labeled beverages, made with no artificial flavors or ingredients. I would start by re-introducing Pepsi Natural. I would market the beverage as the healthier, all natural soda. And, unlike the first round with Pepsi Natural, I would spend some money on the campaign with TV, radio, and Internet advertisements, very similar to what is being done with the Sierra Mist Natural campaign. Again, go here and click on "see the ads". I would look into the Whole Foods/Trader Joe's type stores and work on qualifications for that market as well. I would move on to a "Natural Mountain Dew", providing real citrus flavors with a natural caffeine and sweetness required by Dew drinkers. I would go after the Hansens soda line with a whole new line of Sierra Mist Natural flavored soft drinks. I would introduce all the classic flavors, such as, black cherry, citrus, cranberry, lemon/lime, and others. I would take Sierra Mist to the natural food stores as an alternative to Hansens. Finally, I would continue the Refresh Everything campaign. Pepsi is handing out grants to people that come up with great ideas for the planet, community, environment, education, etc. This is a great way to let everyday people have a chance to make a difference in the world. I would also continue the Green Label Art and Green Label Sound. I would continue the Dew Labs and other social networking programs that let the everyday people feel like they are part of the company. I know when @pepsi or @mtn_dew retweet something I write on Twitter, or when they ask my opinion in designing a new flavor, I feel like I'm already a part of the company. I love it. It builds on my loyalty to the brand...even if my original flavor choice didn't win in the DEWmocracy 2 campaign. I can admit, I picked the wrong flavor to back and help design (although it would have done better if my ideas were more closely followed, heehee). I ended up liking White Out more than Distortion anyway. I love PepsiCo. I hope they hear me and some of this happens. But even if they don't, I'll still drink the "Nectar of Life" (my catch phrase for Mountain Dew), and the beverage of choice will always be Pepsi. Update: PepsiCo wrote me on Twitter and told me they enjoyed my post. They also provided some links to some things they are doing along the same lines. Check out how PepsiCo is changing the way they innovate, here. And read this about the way they are working toward nutrition and "good for you" products. If you were CEO of PepsiCo, I might drink more soda. Seriously, I like your ideas. You might be interested in something else. I'm a rep for Wildtree foods. All natural, no preservatives, no HFCS, no MSG... NO CHEMICALS - just good food, packaged in a way that makes cooking easy and healthful, even delicious. Let me know if you and Lisa would be interested in having some friends over for a tasting!